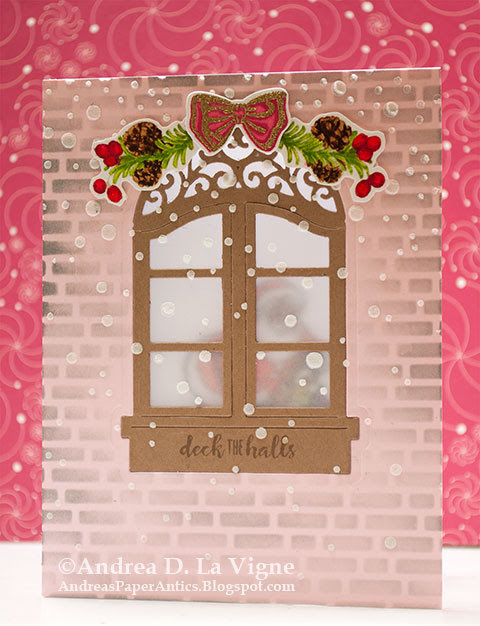 Die Cut Divas' challenge theme for this month has been "Christmas in July." I created this card, using Sketch #SC636 from Splitcoaststampers.com, in response to their challenge. I stamped the "Holiday Mail" image from Deep Red Stamps onto a piece of white cardstock, with Hero Arts Black dye ink. After I colored it with my Prismacolor colored pencils, I cut a slit in the cardstock along the right side of the package in the mailbox. I die cut 3 envelopes using two of the Essentials by Ellen "Bitty Envelope" dies, highlighted the score lines on each with a light grey colored pencil, and slipped them into the slit. I squirted a little glue under each envelope to help hold them in place. I also added Spectrum Noir Clear Overlay glitter pen to the bow, Star Dust Stickles to the snow on the ground & mailbox, and Morning Dew Nuvo Crystal Drops to the berries around the mailbox. Finally, I used a fine-tip black pen to extend the stamp lines where the mailbox post is in the snow. Loosely following the sketch, I die cut a piece of striped paper from my scrap stash with one of the "Stitched Borders 2" dies from Pretty Pink Posh. I trimmed that into a 1.25"-wide strip. I cut my greeting strip from red cardstock. I stamped my greeting, from Hero Arts' "Merry Christmas Messages" set, in Versamark on that strip, and heat embossed it with Recollections Snow embossing powder. To add interest to my background, I die cut several white snowflakes using dies from Sizzix/Tim Holtz "Snowflakes, Mini" set. I ran them through my Xyron Creative Station, to apply adhesive to the back of each, & adhered them to my white A2 card base. 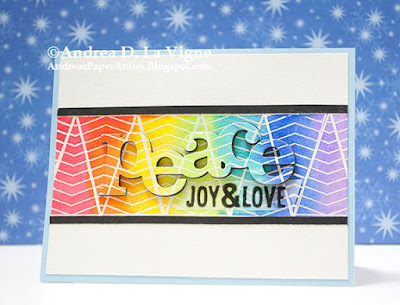 Then I used my ATG tape runner to adhere my striped paper & greeting strips. To help my focal panel stand out a bit more, I inked around the edges with Peeled Paint Distress ink, before adhering it in place. As a finishing touch, I die cut another envelope & punched a small heart from white cardstock. I glued them in place on the greeting strip, and added Star Dust Stickles to the heart. I will send this card for the "Cards for Little Hearts" holiday card drive. They are collecting holiday/winter themed cards for children in Nationwide Children's Hospital who have congenital heart conditions. If you would like to donate cards, you can read more about it at Christina Hor's blog. 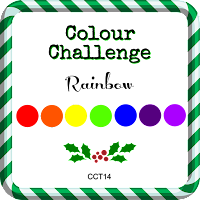 Send a Smile 4 Kids: "Christmas in July 4 Kids"
Simon Says Stamp Work It Wednesday: "Add Sparkle"
a2z Scrapbooking's challenge this month is "Anything Goes." 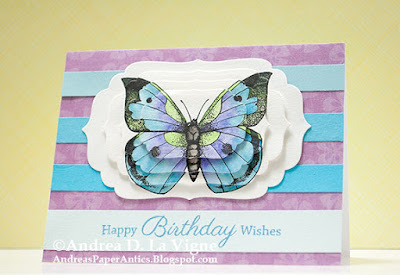 I used one of the butterflies from Hero Arts' "Winged Friends" digi set for this birthday card, following the "Telescoping Image" tutorial on Splitcoaststampers.com. I chose Spellbinders "Labels Four" dies to cut my image. I die cut the largest shape from scratch paper, & scanned that into my computer. I opened that file in Photoshop, & used that to help me size my butterfly. Then I printed just the butterfly two times onto Canson XL Mixed Media Paper. I colored both butterflies with my Inktense pencils, using a damp paintbrush to pick up the color from the pencils & apply it to my paper. When that had dried, I die cut the images, following the directions in the tutorial. For the background, I cut an old piece of purple hibiscus paper (I think it was by The Paper Studio) to A2 size. I adhered that to my white card base. I cut 4 strips of pool colored cardstock, & adhered the 3 thinner ones to the background. 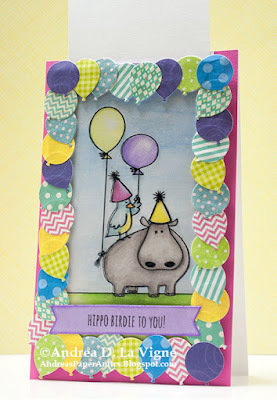 I used Hero Arts Pool ink to stamp my greeting, from Sweet 'n Sassy Stamps' "Script Birthdays" set, onto the fourth strip, and adhered that in place. Finally, I adhered my die cut image pieces, using foam tape to pop up each layer. I think this effect is really neat, though I don't think it would work on a small image. One of our friends is having a birthday next week, so I decided to make her a magic slider card. She's very creative & artistic, so I really think she'll get a kick out of this! I used instructions from a lesson Kelly Marie Alvarez did for an older Online Card Classes class, "Clear & Sheer." 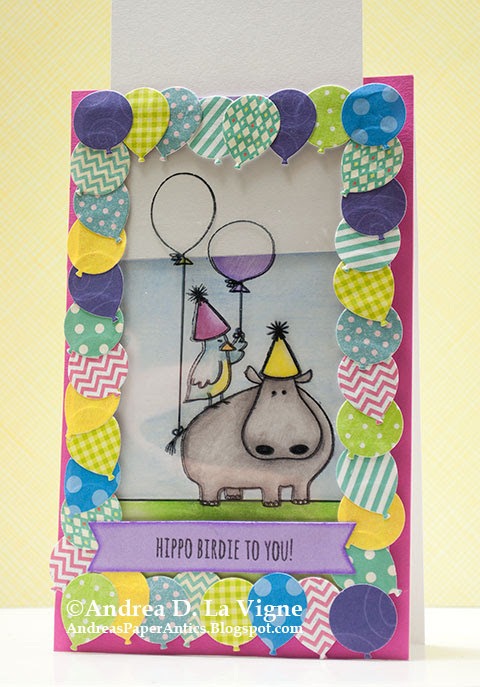 I chose to use Essentials by Ellen's "Wish Big" stamp set for my images & greeting. I began by placing the stamps on my panel, which I had set up in my MISTI. I knew I wanted the bird & hippo to be wearing party hats, so I began by stamping the hat for the hippo in Memento Tuxedo Black ink onto my panel. I then positioned my acetate sheet, and stamped the hat in the same position with StazOn Jet Black ink. I masked the hat on my panel, stamped the hippo, masked the hat on the acetate, and stamped my hippo on that. I repeated this process for the rest of my images. 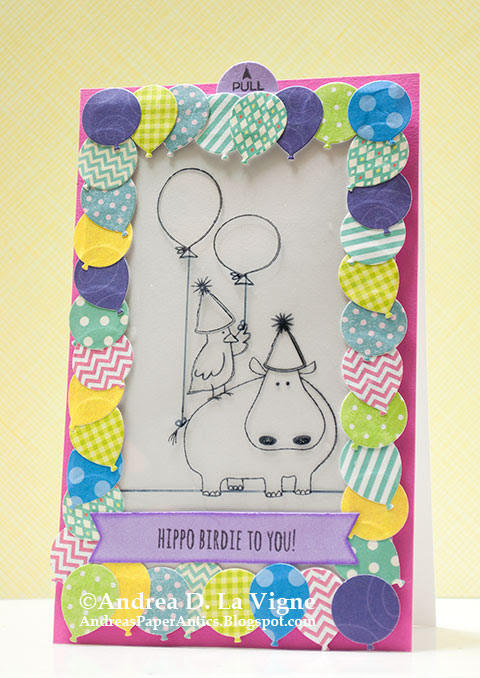 After I'd finished stamping, I used a black Pitt pen to draw the balloon strings & ground line on my cardstock panel. Then I colored all my images & the background with my Prismacolor colored pencils, using Gamsol on paper stumps to blend the colors out. After I'd finished coloring, I lined my acetate over the panel, matching up the stamped lines, & taped it down with painter's tape. I used an ultra-fine-tip Sharpie marker to draw the balloon strings & ground line on the acetate, tracing over the lines on my colored panel. I assembled the magic slider portion of the card as per Kelly's instructions, then got to work on the frame. I cut a piece of purple cardstock to the same dimensions as my window card, and cut out the window with a craft knife. I used Scor Tape to adhere that to my window card. 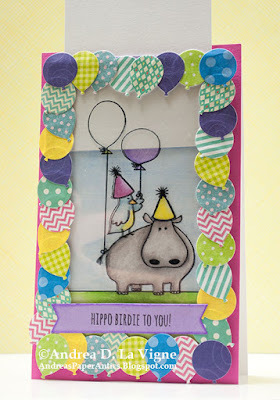 I die cut several balloons using the 2 smallest dies in Lawn Fawn's "Party Balloons" set, and glued them to my frame with Perfect Paper Adhesive. I used 2 other die cut balloons for the pull tab on my slider insert, and stamped the "pull" & an arrow from My Favorite Things' "Interactive Labels" stamp set. For the greeting, I used the banner die from Lawn Fawn's "Stitched Journaling Card" set. Because it only has the one end in a V-shape & wasn't quite long enough, I had to do some partial die cutting. I taped it to purple cardstock, & ran it through my die cutting machine, with the straight end having out of the plates. I then flipped the die around, lining it up with the cut lines, & ran it through my machine again, not cutting the straight end. This gave me a longer banner, with 2 V-shaped ends. 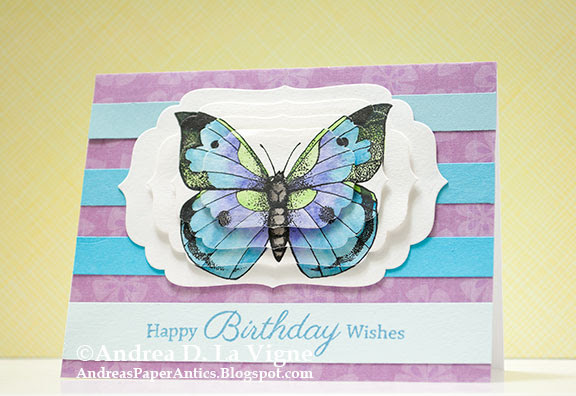 I stamped my greeting and inked around the edges of the banner with Wilted Violet Distress ink. Then I adhered it with Scor Tape to my card front. To finish the card, I used Scor Tape to adhere a piece of fun foam to the back of my slider panel. I mounted that to a piece of magenta cardstock, & adhered that to the front of my white card base. Dies R Us Challenge #76: "Layers"
Lawn Fawnatics has been having a "Watercolor" challenge. I created this card with Lawn Fawn's "Fintastic Friends" stamps & coordinating dies, supplemented with "Otter Ware" stamps & dies from the Essentials by Ellen line. I began with my background. I cut a piece of 140 lb. watercolor paper to 4.25x5.5", and die cut it into sections with the "Stitched Hillside Borders" dies from Lawn Fawn. For the water sections, I applied Mermaid Lagoon & Salty Ocean Distress inks onto my non-stick craft mat, & sprayed them with my homemade Perfect Pearls mist. After taping my watercolor paper pieces back together how they would be on the card (applying painter's tape to the back of the pieces), I smooshed them into the ink puddles. After I got an all-over coverage, I dried the ink with my heat tool, then daubed it back in the ink droplets, to create the look of bubbles. I dried it & dunked it one more time, then mostly dried it again with my heat tool. I set that aside to dry completely while I worked on the rest of my card. For the sand, I took the bottom-most section of watercolor paper, and inked it with Tea Dye Distress ink and a blending tool, adding a little Brushed Corduroy around the edges. I spritzed that piece with water from my Distress Sprayer, and blotted up the water & ink. A little too much ink came up, so I blended on more Tea Dye & a bit of Brushed Corduroy, spritzed it again just a bit, and blotted up the water/ink. After that dried thoroughly, I stamped my greeting, from "Fintastic Friends," in Versafine Onyx Black ink. I stamped several fish & the hermit crab from "Fintastic Friends," as well as the greenery from "Otter Ware," onto scraps of Strathmore Smooth Bristol paper. 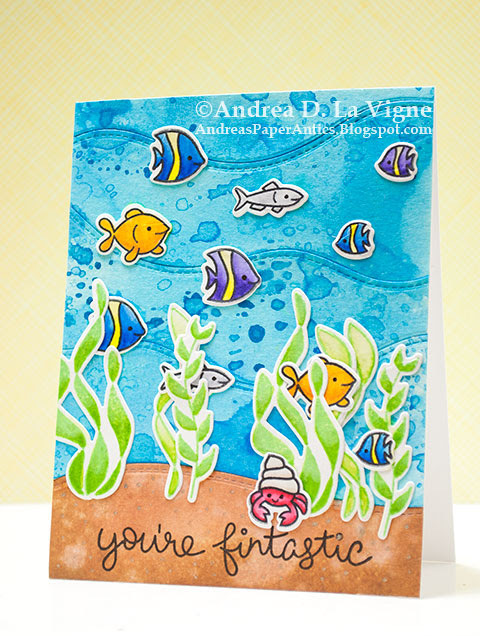 I used the "Otter Ware" stamps because I wanted this to be an ocean underwater scene, and the seaweed stamps in "Fintastic Friends" were just too small. I used Ranger Archival Jet Black ink for the fish & crab, and Hero Arts Green Hills ink for the greenery. Then I used my Tombow markers and a water brush to watercolor them. I also used a green Tombow marker & my water brush on the solid greenery, to add a bit of shading. After I had finished the coloring & everything was dry, I die cut all the images with the coordinating dies. To assemble my card, I removed the tape from the watercolor pieces, then adhered them to a white A2 card base with my ATG tape runner. Then I laid out my images to determine placement. I first glued the greenery pieces just at the very bottom of each with liquid glue, so I could later layer them over a few of the fish. Once I had determined placement of my fish, I glued them in place, and finished gluing the greenery over the fish. As finishing touches, I added some bits of sparkle to the sand with a Sakura Star Dust glitter pen, and accented the eyes of the fish & crab with a black Sakura glaze pen. I also added a coat of clear Wink of Stella to the hermit crab's shell. Our Daily Bread Designs is having their final challenge this month. I must say, I'm really sorry to see it go. I haven't been prolific in entering, but their challenges have always seemed to push me creatively. This one is no different. 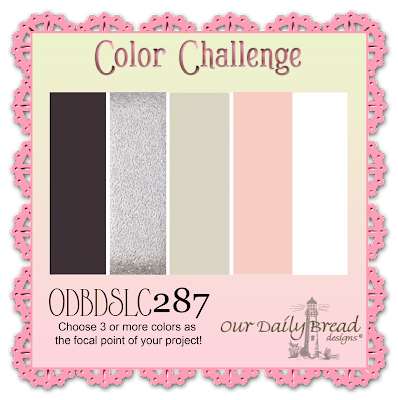 The theme for June is a color challenge. Pick 3 or more colors from the palette provided for your focal point, and make a card. I chose pink, white, black, & silver for my card. I began by heat embossing one of the ornaments from ODBD's "Christmas Ornaments" stamp set onto a scrap of Strathmore Smooth Bristol paper, using Ranger Silver embossing powder. I colored portions with Light Pink & Black Zig Clean Color Real Brush Markers, and fussy cut it out. After die cutting an oval with a Spellbinders "Grand Ovals" die (discontinued), I embossed it with 3 of the "Gold Ovals One" dies. I used Perfect Paper Adhesive to glue the ornament to the embossed oval. For the greeting, I used ODBD's "Let It Snow" stamp set. I stamped the greeting on bristol with Versamark, and heat embossed it with silver embossing powder. I die cut that with a Spellbinders "Grommet Tags" die (discontinued), & inked the edges of that with Worn Lipstick Distress ink. I have to admit, I really struggled with the background. I wanted something that wasn't just flat, but that also didn't compete with the focal point of my card. I found the "Mini Rosetta" stencil from The Crafters Workshop in my supplies, and decided to do something with that. I adhered it to a piece of black cardstock cut to 4.25x5.5" (I had previously applied repositionable spray adhesive to the back). Then I inked all over the panel with Delicata Silvery Shimmer pigment ink, using the direct-to-paper technique. When I lifted the stencil, though, I had one hot mess on my hands! Despite the adhesive on the stencil, ink had still seeped underneath, and I ended up with an almost totally silver panel, with just hints of the stencil design. NOT what I wanted! So I had to regroup. I sat at my desk & thought for a minute, and an idea popped into my head. Could I do a monoprint with the stencil instead? So I cut another black panel, and inked up the stencil with Silvery Shimmer. I laid my panel--carefully--over the stencil, and went over it several times with my brayer. Then I lifted the panel from the stencil--and had a nice, shimmery background design! Yay!!!! After I was sure it was dry, I glued my matted ornament & greeting to the panel. I added a black brad in each hole in the "Grommet Tag" die cut, adhered the panel to a white A2 card base, and rounded the corners with a 1/2" Corner Chomper.